CoaguSense™ PT/INR Monitoring System is the first PT/INR system to directly detect clot formation representing a breakthrough in PT/INR testing design simplicity! Two million new people start taking the oral anticoagulant drug Coumadin® (warfarin) every year to prevent blood clots, heart attacks and stroke. Correct dosing of Coumadin is determined for each patient by periodically measuring blood clotting time using the prothrombin time (PT) test. The simplicity of the new CoaguSense system offers clinicians not only the performance they require but also the reliability they demand. 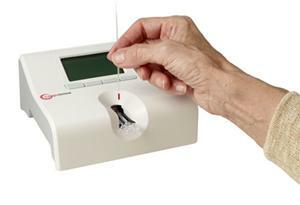 With the recent expansion in Medicare coverage, most patients on warfarin can now easily test their PT/INR with confidence in their own home. Intended Use- The CoaguSense Self-Test PT Monitoring System is an in vitro diagnostic device that provides quantitative prothrombin time (PT) results, expressed in seconds and international normalized ratio (INR) units. It uses fresh capillary whole blood. It is intended for use by properly selected and suitably trained patients or their caregivers on the order of the treating doctor. Patients should be stabilized on warfarin-type (coumarin) anticoagulation therapy prior to self-testing with the CoaguSense Self-Test PT Monitoring System. It is not intended to be used for screening purposes. If you are taking oral anticoagulants such as Coumadin® (warfarin), PT/INR Self-Testing represents a truly convenient testing option. Testing can easily be performed once a week in the comfort of your own home. In addition to the convenience, studies have shown that patients performing home PT/INR testing spend more time in therapeutic range because they are able to monitor their trends.¹ After each test, patients notify their physician of the results and the physician will determine if any treatment adjustments are required. The goal of self-monitoring PT/INR levels is to improve control and reduce the potential for adverse events. References: 1. Oral anticoagulation patient self-testing: Consensus guidelines for practical implementation. Managed Care. 2008;17(suppl 9):1-8. When clinicians and researchers want the most accurate means of determining prothrombin time, they turn to either the World Health Organization (WHO) mechanical tilt-tube technique or the Fibrometer. Both these methods use a mechanical approach to directly detect clot formation, but they are cumbersome to perform. The new CoaguSense PT/INR Monitoring System represents a breakthrough in point-of-care prothrombin time monitoring technology by miniaturizing and simplifying a direct mechanical means of detecting clot formation. By directly detecting the clot, the CoaguSense system avoids the challenges that plague other systems that use secondary means of clot detection like monitoring changes in impedance or pressure. For example, the concentration of red blood cells or other substances in blood sample can affect results in the measurement process of those products. The CoaguSense system simply lifts the fibrin clot from the reaction well which interrupts a light beam. The PT time is the actual time from when the blood sample is applied to when the clot is formed. Accurate results in less than a minute-The CoaguSense meter directly measures the prothrombin time, so the time required to perform a test is the actual prothrombin time in seconds. 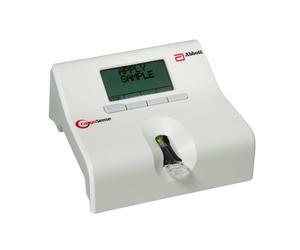 By not using look-up tables or curve fitting algorithms, the Coagusense meter offers both speed and accuracy. Superb Precision-CoaguSense's patented micro mechanical detection system delivers superb precision and reliability. Professionals testing with the CoaguSense system have demonstrated %CV's of 2.5%. Unlike electrochemical detection based devices, the CoaguSense system does not rely on the concentration of blood constituents not involved in clot formation to produce results. This improves precision and reduces variability in readings often seen in other systems. Red Blood Cells Not Required-Because the CoaguSense system uses a micro mechanical means of clot detection instead of electrochemical, re-calcified plasma control strips can be run as easily as whole blood. This also means that the CoaguSense system is not affected by low hemoglobin or hematocrit levels, a common source of inaccurate results in systems using current to detect clot formation. Small sample size (10 µl minimum) for easy dosing-Only 10µl of fingerstick sample is required to run the CoaguSense system. To reduce strip waste caused by unsteady hands, sample is easily transferred from the patient's finger to the test strip using the minipipette or sample transfer tubes provided. Offers true controls using the actual thromboplastin and plasma-The purpose of quality control testing for a prothrombin time test system is to verify the integrity of both device and reagent performance. CoaguSense is the first system to offer true high and low control strips which contain the same thromboplastin used in the patient test strip along with plasma of known INR. There is no substitute for confirming performance of the actual thromboplastin used in the patient test strips. AC powered or battery powered for convenience included in the kit. In bold is what is included in Welcome Kit.